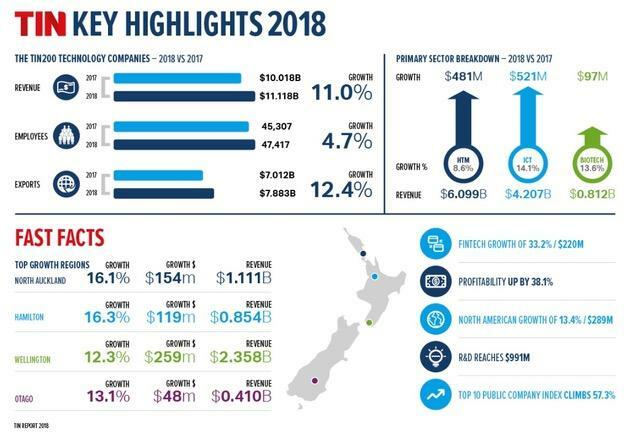 The Technology Investment Network - a private company established in 1999 to facilitate the growth of the NZ technology export sector — says New Zealand's top 200 technology companies earned combined revenues of $11.1 billion in 2018, up $1.1 billion from 2017, and boosted their profitability by 38.1 percent. TIN says exports were the main contributor to this growth, growing 12.4 percent to reach a total of nearly $8 billion. The North American and Australian markets provided the bulk of growth ($571 million combined), but Europe was the fastest growing sector rising 16.7 percent. TIN said European performance showed the ability of the TIN200 to compete and win in global markets. The findings come from the 2018 TIN Report, launched in Auckland on 24 October. It monitors the performance of New Zealand’s 200 largest technology exporters in the areas of information and communications technology, high-tech manufacturing and biotechnology, dubbed the TIN100 and the NEXT100. It is sponsored by New Zealand Trade and Enterprise, Spark, EY, Absolute IT, James & Wells and Simmonds Stewart. ICT companies accounted for almost half this year’s TIN200 revenue growth, adding $521 million in combined revenue. High-tech manufacturing and biotech firms also trended above their historical averages, increasing revenue by 8.6 percent and 13.6 percent respectively. However, Fintech companies led the field with 33.2 revenue growth, totalling $220 million. Combined the 200 companies spent $991 million on R&D, a 10.2 percent increase. TIN said that, for the first time in the 14-year history of its report, there were more ICT companies than high-tech manufacturing firms in the TIN200. Also, of the record 19 new entries joining the TIN200 ranks this year, more than half of these were ICT firms. According to the TIN Report, the tech sector now employs 47,417 people globally with just over half in New Zealand. "These jobs yield significantly higher wages than the national average, providing the opportunity for tech to help raise wellbeing and address economic disparities in New Zealand," TIN said. 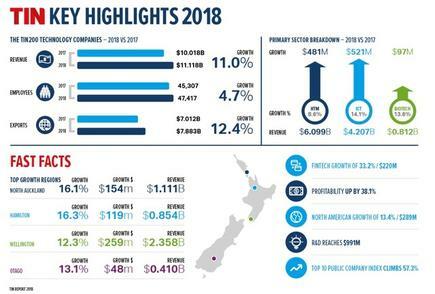 This year’s TIN Report shows growth spread across all New Zealand, with over half of the regions achieving revenue increases over 10 percent, TIN said. "The combined Greater Auckland and Northland regions accounted for 122 of the TIN200 companies and had a particularly strong year – contributing 54.9 percent (or $604m) of total TIN200 revenue growth," TIN said. "The Hamilton and North Auckland/Northland regions each grew by over 16 percent, and Otago/Southland grew by 13 percent. The Wellington/Lower North Island region grew by more than 12 percent to reach more than $2.3 billion of this year’s total TIN200 turnover; the second-largest revenue generator after South Auckland (with $5.2 billion revenue)." TIN-tracked companies received more than $200 million in offshore investments in the past two years, including $41.2 million dollars invested in FY2018. There were also eight foreign buyouts of TIN200 firms in the past year, all focused on companies in sectors with high growth and unique IP, TIN said. HMI Technologies, which designs and builds custom intelligent transport systems, including variable signage and autonomous vehicles won this year’s TIN Rocket Award, given to the company rising the most places in the TIN200 ranking (44 places). In the past year, HMI has secured a $US20 million joint venture with the City of Heshan in China to distribute its Ohmio electric shuttles. "This deal contributed to the firm’s improved growth of $6.5 million in FY2018, the highest of any Next100 company," TIN said. "As a result, HMI Technologies also joined the Absolute IT Supreme Scale-Ups awards list in second place this year." The TIN Report can be ordered in eBook or hard copy from http://www.tin100.com. Lists of the top ten and most promising companies in each category are available at https://tin100.com/lists, and a further regional breakdown is available at https://tin100.com/regional-data.